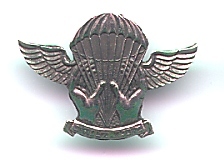 Israel Army Parachute Folders Unit Pin. The Paratroopers Brigade (Hativat HaTzanhanim) is a unit of paratroopers within the Israel Defense Forces (IDF) it's part of central command. It has a history of carrying out special forces-style missions dating back to the 1950s. The brigade was created at the mid 1950's when the commando Unit 101 was merged with Battalion 890 (the IDF's Airborne Commando unit) in order to form an elite infantry brigade. The new unit was equipped with the IMI Uzi submachine gun as their primary weapon as it provided light and small automatic fire - essential properties for recon units and commandos. The goals in creating the Paratroopers Brigade were: 1. To have an elite infantry force. 2. To innovate and improve fighting skills within other infantry units. 3. To raise the next generation of military commanders and officers. In the Six Day War (1967) the Paratroopers Brigade took part in the capturing of Jerusalem together with the Jerusalem Brigade, Harel Brigade and armor support. The Paratroopers were the ones to capture the Western Wall and the Temple Mount - a moment that is considered as "historic" and the "highlight of this war" by the majority of the Israeli public, mainly due to the sacredness of these places to the Jewish people. In the following years, the brigade was the source for many Israeli Chiefs of Staff, including Shaul Mofaz and Moshe Ya'alon. Serving in the brigade is voluntary and requires passing different arduous physical and mental tests. The IDF has three reservist Paratrooper brigades at any given time, consisting of personnel who served their mandatory service in the brigade, and whom are mostly in their twenties (aside from officers). These are most likely the most highly-trained reservist brigades in the Israeli army.